We present our 3d horizontal flow 4 stages proto typing PowerPoint Slides. Use our Arrows PowerPoint Templates because, you know your business and have a vision for it. Use our Marketing PowerPoint Templates because, There are various viable propositions available to further your commercial interests. Use our Success PowerPoint Templates because, Amplify on your plans to have dedicated sub groups working on related but distinct tasks. Use our Process and Flows PowerPoint Templates because, you have the process in your head, our template design showing will illuminate your thoughts. Use our Business PowerPoint Templates because, Spread the light of knowledge around you, clear the doubts and enlighten the questioning minds with your brilliance and ability. Use these PowerPoint slides for presentations relating to Algorithm, Arrow, Arrows Block, Business, Chart, Connection, Design, Development, Diagram, Direction, Element, Flow, Flowchart, Graph, Kind, Linear, Management, Organization, Process, Program, Section, Segment, Set, Sign, Solution, Strategy, Symbol. The prominent colors used in the PowerPoint template are Red, Green, and Blue Make them smell the coffee with our 3d Horizontal Flow 4 Stages Proto Typing PowerPoint Slides. Help them come to the correct conclusion. Dispel any apprehensions that may arise. Our 3d Horizontal Flow 4 Stages Proto Typing PowerPoint Slides make your argiments appear convincing. We present our 3d linear flow navigation arrow 2 stages home electrical wiring PowerPoint templates. Use our Arrows PowerPoint Templates because, you understand how each drives the next to motor the entire sequence. Use our Marketing PowerPoint Templates because, Now you have to coordinate and motivate your team. Use our Success PowerPoint Templates because, But you have an idea of which you are sure. Use our Process and Flows PowerPoint Templates because; inform them of the various means they have to achieve them. Use our Business PowerPoint Templates because, Marketing Strategy Business Template: - Maximizing sales of your product is the intended destination. Use these PowerPoint slides for presentations relating to Algorithm, Arrow, Arrows Block, Business, Chart, Connection, Design, Development, Diagram, Direction, Element, Flow, Flowchart, Graph, Kind, Linear, Management, Organization, Process, Program, Section, Segment, Set, Sign, Solution, Strategy, Symbol. The prominent colors used in the PowerPoint template are Red, Orange, and Black Our 3d Linear Flow Navigation Arrow 2 Stages Home Electrical Wiring PowerPoint Templates provide many a facility. They assist in the assimilation of your ideas. Our 3d Linear Flow Navigation Arrow 2 Stages Home Electrical Wiring PowerPoint Templates give exceptional value. You will be amazed at the awesome returns. We present our 3d arrow dilemma of puzzle process 7 stages make flowchart PowerPoint templates.Present our Arrows PowerPoint Templates because this emphasises on the relevance and importance of all milestones along the way. Download our Puzzles or Jigsaws PowerPoint Templates because this diagram has the unique ability to drive home your ideas and show how they mesh to guarantee success. Download our Signs PowerPoint Templates because they are Designed to attract the attention of your audience. Use our Leadership PowerPoint Templates because you have the process in your head, our template design showing will illuminate your thoughts. Download and present our Process and Flows PowerPoint Templates because this slide is Designed to help bullet-point your views and thoughts.Use these PowerPoint slides for presentations relating to 3d Puzzle process, Arrow, Arrows Block, Business, Chart, Design, Development, Diagram, Direction, Element, Flow, Flowchart, Graph, Linear, Management, Organization, Process, Program, Section, Sign, Solution, Symbol. The prominent colors used in the PowerPoint template are Green, Yellow, Green dark . 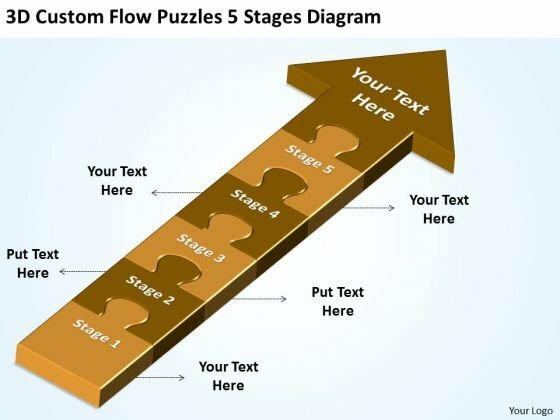 Customers tell us our 3d arrow dilemma of puzzle process 7 stages make flowchart PowerPoint templates will help them to explain complicated concepts. The feedback we get is that our Chart PowerPoint templates and PPT Slides are Nice. Professionals tell us our 3d arrow dilemma of puzzle process 7 stages make flowchart PowerPoint templates are No-nonsense. People tell us our Arrows PowerPoint templates and PPT Slides are Attractive. 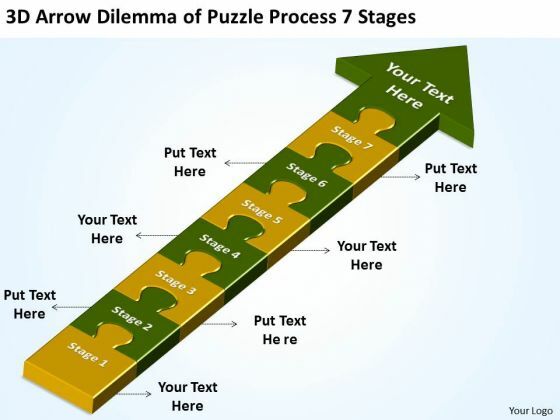 Customers tell us our 3d arrow dilemma of puzzle process 7 stages make flowchart PowerPoint templates provide you with a vast range of viable options. Select the appropriate ones and just fill in your text. Professionals tell us our Arrow PowerPoint templates and PPT Slides are readymade to fit into any presentation structure. Our 3d Arrow Dilemma Of Puzzle Process 7 Stages Make Flowchart PowerPoint Templates are arguably exceptional. Your ideas will be hard to argue against. Our 3d Arrow Dilemma Of Puzzle Process 7 Stages Make Flowchart PowerPoint Templates provide a common thread. Stitch all different factions together. 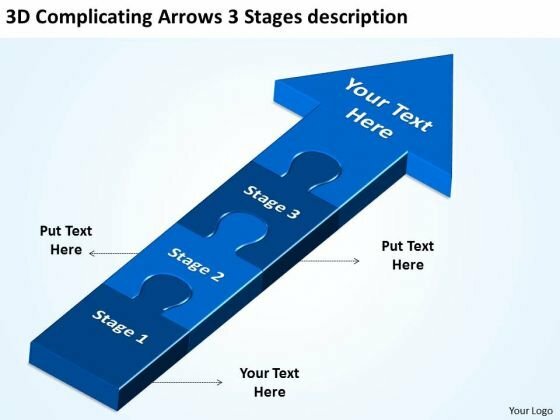 We present our 3d complicating arrows stages description Slides flow charts PowerPoint templates.Use our Arrows PowerPoint Templates because you can Adorn them with your ideas and thoughts. Use our Puzzles or Jigsaws PowerPoint Templates because generation of sales is the core of any business. Download and present our Signs PowerPoint Templates because clarity of thought has been the key to your growth. Present our Leadership PowerPoint Templates because using our templates for your colleagues will impart knowledge to feed. Download our Process and Flows PowerPoint Templates because if making a mark is your obsession, then let others get Obsessed with you.Use these PowerPoint slides for presentations relating to 3d Puzzle process, Arrow, Arrows Block, Business, Chart, Design, Development, Diagram, Direction, Element, Flow, Flowchart, Graph, Linear, Management, Organization, Process, Program, Section, Sign, Solution, Symbol. The prominent colors used in the PowerPoint template are Blue, Blue navy, Black. Customers tell us our 3d complicating arrows stages description Slides flow charts PowerPoint templates are Endearing. The feedback we get is that our Chart PowerPoint templates and PPT Slides are Radiant. Professionals tell us our 3d complicating arrows stages description Slides flow charts PowerPoint templates are Enchanting. People tell us our Arrows PowerPoint templates and PPT Slides are Upbeat. Customers tell us our 3d complicating arrows stages description Slides flow charts PowerPoint templates provide you with a vast range of viable options. Select the appropriate ones and just fill in your text. Professionals tell us our Chart PowerPoint templates and PPT Slides are Awesome. Step on it with our 3d Complicating Arrows Stages Description Slides Flow Charts PowerPoint Templates. Escalate the process with our 3d Complicating Arrows Stages Description Slides Flow Charts PowerPoint Templates. Exult in the comfort of our 3d Complicating Arrows Stages Description Slides Flow Charts PowerPoint Templates. Experience the convenience they deliver. We present our 3d custom flow puzzles 5 stages diagram free schematic PowerPoint Slides.Download and present our Arrows PowerPoint Templates because they will help you to organise the logic of your views. Present our Puzzles or Jigsaws PowerPoint Templates because you know what it takes to keep it fit and healthy. Use our Signs PowerPoint Templates because you can expound on how you plan to gain their confidence and assure them of continued and consistent excellence in quality of service. Present our Leadership PowerPoint Templates because this diagram can be used to illustrate the logical path or system. Download our Process and Flows PowerPoint Templates because you have a clear vision of the cake you want.Use these PowerPoint slides for presentations relating to 3d Puzzle process, Arrow, Arrows Block, Business, Chart, Design, Development, Diagram, Direction, Element, Flow, Flowchart, Graph, Linear, Management, Organization, Process, Program, Section, Sign, Solution, Symbol. The prominent colors used in the PowerPoint template are Brown, Orange, Black. Customers tell us our 3d custom flow puzzles 5 stages diagram free schematic PowerPoint Slides are Colorful. The feedback we get is that our Arrow PowerPoint templates and PPT Slides have awesome images to get your point across. Professionals tell us our 3d custom flow puzzles 5 stages diagram free schematic PowerPoint Slides are Whimsical. People tell us our Block PowerPoint templates and PPT Slides will make the presenter successul in his career/life. Customers tell us our 3d custom flow puzzles 5 stages diagram free schematic PowerPoint Slides are Awesome. Professionals tell us our process PowerPoint templates and PPT Slides are Pleasant. Be the executive with our 3d Custom Flow Puzzles 5 Stages Diagram Free Schematic PowerPoint Slides. They will project your authority. Beat the clock with our 3d Custom Flow Puzzles 5 Stages Diagram Free Schematic PowerPoint Slides. They keep you ahead in the race. We present our 3d puzzle arrow 2 steps execution process flow diagram PowerPoint templates.Present our Arrows PowerPoint Templates because getting it done may not be enough. Present our Symbol PowerPoint Templates because this Diagram pinpoints the critical paths and areas in your process and set the timelines for their completion. Present our Marketing PowerPoint Templates because it illustrates the symbols of human growth. Download our Leadership PowerPoint Templates because this diagram can be used to illustrate the logical path or system. Download our Process and Flows PowerPoint Templates because you can Be the cynosure of all eyes with our template depicting .Use these PowerPoint slides for presentations relating to Arrow, Arrows Block, Business, Chart, Design, Development, Diagram, Direction, Element, Flow, Flowchart, Graph, Linear, Management, Organization, Process, Program, Section, Sign, Solution, Symbol. The prominent colors used in the PowerPoint template are Blue, Blue navy, Gray. Customers tell us our 3d puzzle arrow 2 steps execution process flow diagram PowerPoint templates are Romantic. The feedback we get is that our Design PowerPoint templates and PPT Slides will help them to explain complicated concepts. Professionals tell us our 3d puzzle arrow 2 steps execution process flow diagram PowerPoint templates are Upbeat. People tell us our Diagram PowerPoint templates and PPT Slides are No-nonsense. Customers tell us our 3d puzzle arrow 2 steps execution process flow diagram PowerPoint templates are Ultra. Professionals tell us our Chart PowerPoint templates and PPT Slides are Romantic. 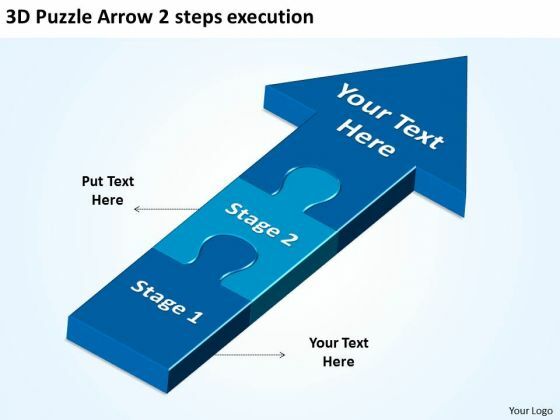 There is no destination too far for our 3d Puzzle Arrow 2 Steps Execution Process Flow Diagram PowerPoint Templates. They willget you there within a jiffy. Achieve cross-functional team leadership with our 3d Puzzle Arrow 2 Steps Execution Process Flow Diagram PowerPoint Templates. They will make you look good. We present our step arrow procedure 3 stages po process flow chart PowerPoint Slides.Download and present our Arrows PowerPoint Templates because you have the ideas to develop the teams vision of where they need to be in the future. Download and present our Symbol PowerPoint Templates because this diagram helps you to light up enthusiasm in your team like dream emerge.ge. Download and present our Marketing PowerPoint Templates because it gives you really bright ideas. Download and present our Leadership PowerPoint Templates because you have what it takes to grow. Use our Process and Flows PowerPoint Templates because there is a crucial aspect that requires extra attention.Use these PowerPoint slides for presentations relating to Arrow, Arrows Block, Business, Chart, Design, Development, Diagram, Direction, Element, Flow, Flowchart, Graph, Linear, Management, Organization, Process, Program, Section, Sign, Solution, Symbol. The prominent colors used in the PowerPoint template are Blue, Green, Black. Customers tell us our step arrow procedure 3 stages po process flow chart PowerPoint Slides will save the presenter time. The feedback we get is that our Development PowerPoint templates and PPT Slides are Multicolored. Professionals tell us our step arrow procedure 3 stages po process flow chart PowerPoint Slides are Majestic. People tell us our Chart PowerPoint templates and PPT Slides are Fancy. Customers tell us our step arrow procedure 3 stages po process flow chart PowerPoint Slides are Cheerful. Professionals tell us our Diagram PowerPoint templates and PPT Slides are Fun. Take your cause forward with passion. Our Step Arrow Procedure 3 Stages Po Process Flow Chart PowerPoint Slides will espouse your thoughts. Our Step Arrow Procedure 3 Stages Po Process Flow Chart PowerPoint Slides get the audience to accept your credentials. They will acknowledge your professional acumen. 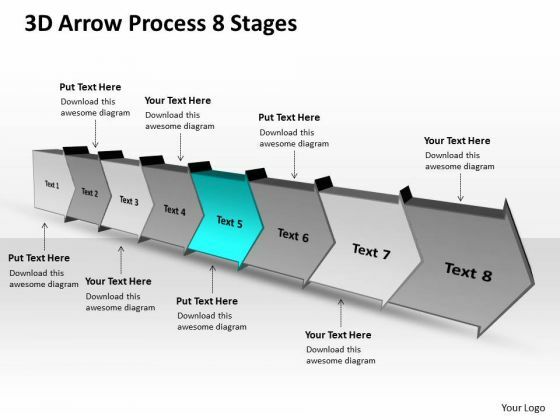 We present our 3d arrow process 8 stages schematic drawing PowerPoint templates. Use our Arrows PowerPoint Templates because; Highlight the key components of your entire manufacturing/ business process. Use our Business PowerPoint Templates because; now use this slide to transmit this clarity of purpose onto the eager minds of your team. Use our Design PowerPoint Templates because, strengthen your relationship with your present customers and likely future ones as the occasion has an intrinsic business potential. Use our Signs PowerPoint Templates because, guaranteed to focus the minds of your team. Use our Metaphor PowerPoint Templates because, Put them down and present them using our innovative templates. Use these PowerPoint slides for presentations relating to Arrow, Arrows Block, Business, Chart, Design, Development, Diagram, Direction, Element, Flow, Flowchart, Graph, Linear, Management, Organization, Process, Program, Section, Sign, Solution, Symbol. The prominent colors used in the PowerPoint template are Blue, Gray, and Black Hit exceptional ratings with our 3d Arrow Process 8 Stages Schematic Drawing PowerPoint Templates. Astound the audience with your display. Advocate good citizenship with our 3d Arrow Process 8 Stages Schematic Drawing PowerPoint Templates. Spread environmental awareness with your thoughts. We present our 3d arrow process 8 stages production flow chart PowerPoint Slides. Use our Arrows PowerPoint Templates because, coincidentally it always points to the top. Use our Business PowerPoint Templates because, Leadership Template: - Show them the way, be Captain of the ship and lead them to new shores. Use our Design PowerPoint Templates because, Health of the determines the quality of our lives. Use our Signs PowerPoint Templates because, you have some great folks working with you, thinking with you. Use our Metaphor PowerPoint Templates because, It has inspired a whole new world of medical endeavor. Use these PowerPoint slides for presentations relating to Arrow, Arrows Block, Business, Chart, Design, Development, Diagram, Direction, Element, Flow, Flowchart, Graph, Linear, Management, Organization, Process, Program, Section, Sign, Solution, Symbol. The prominent colors used in the PowerPoint template are Blue, Gray, and Black Our 3d Arrow Process 8 Stages Production Flow Chart PowerPoint Slides deliver the bounty you deserve. Earn ample dividends from your efforts. Achieve cross-functional team leadership with our 3d Arrow Process 8 Stages Production Flow Chart PowerPoint Slides. They will make you look good. We present our 3d arrow process 8 stages Business flow chart free PowerPoint templates. Use our Arrows PowerPoint Templates because, Brilliant ideas popping up all over the place. Use our Business PowerPoint Templates because; inform them of the various means they have to achieve them. Use our Design PowerPoint Templates because; explain the process by which you intend to right it. Use our Signs PowerPoint Templates because, an innovative slide design depicting driving home the relevance of a steady rhythm. Use our Metaphor PowerPoint Templates because, Weak Links & Chains: - Chain reactions and the element of teamwork add value to your efforts. Use these PowerPoint slides for presentations relating to Arrow, Arrows Block, Business, Chart, Design, Development, Diagram, Direction, Element, Flow, Flowchart, Graph, Linear, Management, Organization, Process, Program, Section, Sign, Solution, Symbol. The prominent colors used in the PowerPoint template are Green dark, Gray, Black Spread awareness of digital tools. Whatever the divide our PT&s will bridge it. Be a peacemaker with our 3d Arrow Process 8 Stages Business Flow Chart Free PowerPoint Templates. You will come out on top. We present our 3d arrow process 8 stages Chart flow chart free PowerPoint templates. Use our Arrows PowerPoint Templates because, And watch them strengthen your companys sinews. Use our Business PowerPoint Templates because, Use this slide to detail and highlight your thought process, your views and your positive expectations. Use our Design PowerPoint Templates because, they are logical, accurate and to the point. Use our Signs PowerPoint Templates because, they enhance the essence of your viable ideas. Use our Metaphor PowerPoint Templates because, Master them all and you have it made. Use these PowerPoint slides for presentations relating to Arrow, Arrows Block, Business, Chart, Design, Development, Diagram, Direction, Element, Flow, Flowchart, Graph, Linear, Management, Organization, Process, Program, Section, Sign, Solution, Symbol. The prominent colors used in the PowerPoint template are Blue, Gray, and Black Our 3d Arrow Process 8 Stages Chart Flow Chart Free PowerPoint Templates aredelightfully crafted. Designed to charm the biggest disbelievers. Create your domain with our 3d Arrow Process 8 Stages Chart Flow Chart Free PowerPoint Templates. Give your thoughts a distinct abode. 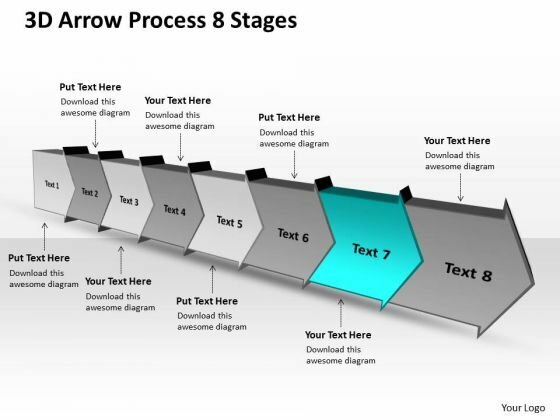 We present our 3d arrow process 8 stages flow chart free PowerPoint templates. Use our Arrows PowerPoint Templates because; Lay down the fundamentals to build upon. Use our Business PowerPoint Templates because; motivate your team to cross all barriers. Use our Design PowerPoint Templates because, Start with the fundamental basic activities and slowly but surely hone them down to the top of the pyramid, the ultimate goal. Use our Signs PowerPoint Templates because, Timelines Template:- Getting it done may not be enough. Use our Metaphor PowerPoint Templates because, Focus on each one and investigate which one would be the best fit for your needs. Use these PowerPoint slides for presentations relating to Arrow, Arrows Block, Business, Chart, Design, Development, Diagram, Direction, Element, Flow, Flowchart, Graph, Linear, Management, Organization, Process, Program, Section, Sign, Solution, Symbol. The prominent colors used in the PowerPoint template are Green dark, Gray, Black Add on the colours with our 3d Arrow Process 8 Stages Flow Chart Free PowerPoint Templates. Give your views a decorative look. Start driving innovation with our 3d Arrow Process 8 Stages Flow Chart Free PowerPoint Templates. They will make you look good. We present our 3d arrow process 8 stages ppt flow chart free PowerPoint templates. Use our Arrows PowerPoint Templates because, Visual appeal is a priority for us. Use our Business PowerPoint Templates because; Get your listeners to put on their thinking caps. Use our Design PowerPoint Templates because; Let your words be the drops of wisdom spreading knowledge and peace like ripples through the expectant minds of your devoted followers. Use our Signs PowerPoint Templates because, they help to focus the thoughts of your listeners. Use our Metaphor PowerPoint Templates because, The ideas and plans are on your fingertips. Use these PowerPoint slides for presentations relating to Arrow, Arrows Block, Business, Chart, Design, Development, Diagram, Direction, Element, Flow, Flowchart, Graph, Linear, Management, Organization, Process, Program, Section, Sign, Solution, Symbol. 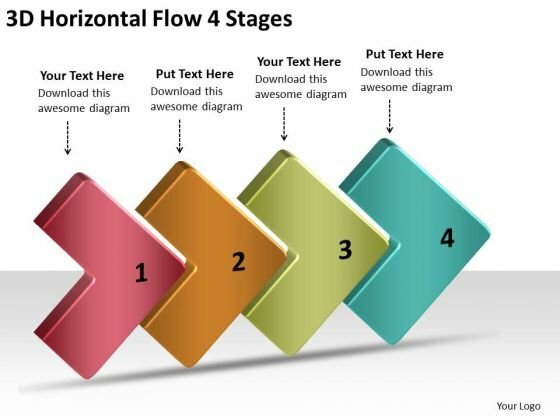 The prominent colors used in the PowerPoint template are Blue, Gray, and Black An array of colors give our 3d Arrow Process 8 Stages Ppt Flow Chart Free PowerPoint Templates an alluring blend. They make your thoughts very enticing. 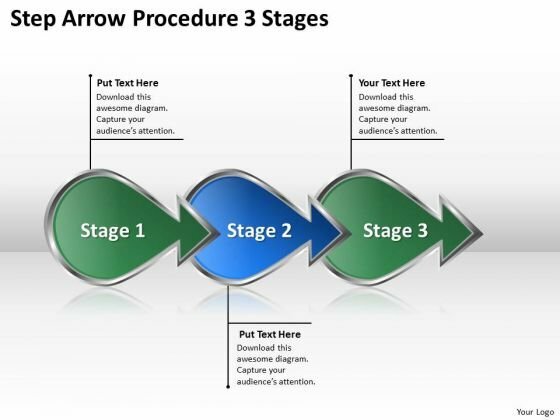 Set a good example with our 3d Arrow Process 8 Stages Ppt Flow Chart Free PowerPoint Templates. Be the benchmark for others to follow. We present our 3d arrow process 8 stages ppt production flow chart PowerPoint Slides. Use our Arrows PowerPoint Templates because, Show them how to persistently hit bulls eye. Use our Business PowerPoint Templates because, Marketing Strategy Business Template:- Maximizing sales of your product is the intended destination. Use our Design PowerPoint Templates because; illustrate your chain of ideas focusing on that aspect or resource in order to enhance the quality of your product. Use our Signs PowerPoint Templates because; Grab the attention of your team with this eye catching template signifying. Use our Metaphor PowerPoint Templates because, you know what it takes to keep it fit and healthy. Use these PowerPoint slides for presentations relating to Arrow, Arrows Block, Business, Chart, Design, Development, Diagram, Direction, Element, Flow, Flowchart, Graph, Linear, Management, Organization, Process, Program, Section, Sign, Solution, Symbol. The prominent colors used in the PowerPoint template are Green dark, Gray, Black Your ideas deserve more exposure. Our 3d Arrow Process 8 Stages Ppt Production Flow Chart PowerPoint Slides will ensure due coverage. Operate efficiently with our 3d Arrow Process 8 Stages Ppt Production Flow Chart PowerPoint Slides. Download without worries with our money back guaranteee. We present our 3d interconnected arrows 7 stages proto typing PowerPoint Slides. Use our Arrows PowerPoint Templates because, you have some hits, you had some misses. Use our Marketing PowerPoint Templates because; enlighten others on the process with this innovative graphic to authenticate your plan of achieving the goal of added value/profit. Use our Success PowerPoint Templates because, Health of the determines the quality of our lives. Use our Process and Flows PowerPoint Templates because, our cleverly selected background hues are guaranteed to achieved this aim. Use our Business PowerPoint Templates because, Drive home your reasons and chart the path ahead to arrive at tour destination and achieve the goal. Use these PowerPoint slides for presentations relating to Algorithm, Arrow, Arrows Block, Business, Chart, Connection, Design, Development, Diagram, Direction, Element, Flow, Flowchart, Graph, Kind, Linear, Management, Organization, Process, Program, Section, Segment, Set, Sign, Solution, Strategy, Symbol. 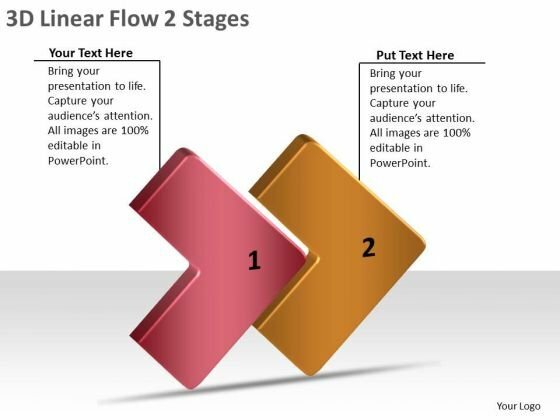 The prominent colors used in the PowerPoint template are Red, Orange, and Green Make the event with our 3d Interconnected Arrows 7 Stages Proto Typing PowerPoint Slides. Your thoughts will be really happening. 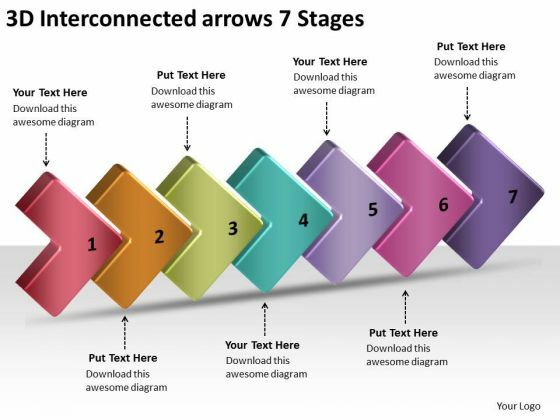 Our 3d Interconnected Arrows 7 Stages Proto Typing PowerPoint Slides are generous to an excess. They will give their all most willingly. We present our 3d linear flow 2 stages home electrical wiring PowerPoint templates. Use our Arrows PowerPoint Templates because; you have the basic goal in mind. Use our Marketing PowerPoint Templates because; Use them to your advantage to priorities your ideas. Use our Success PowerPoint Templates because, you have made significant headway in this field. Use our Process and Flows PowerPoint Templates because, you have some excellent plans to spread some more of it across your community. Use our Business PowerPoint Templates because, you have the people in place, selected the team leaders and all are raring to go. Use these PowerPoint slides for presentations relating to Algorithm, Arrow, Arrows Block, Business, Chart, Connection, Design, Development, Diagram, Direction, Element, Flow, Flowchart, Graph, Kind, Linear, Management, Organization, Process, Program, Section, Segment, Set, Sign, Solution, Strategy, Symbol. The prominent colors used in the PowerPoint template are Red, Orange, and Black Support your thoughts with our 3d Linear Flow 2 Stages Home Electrical Wiring PowerPoint Templates. Download without worries with our money back guaranteee. Bolster the excitement with our 3d Linear Flow 2 Stages Home Electrical Wiring PowerPoint Templates. They will not let the enthusiasm fade. 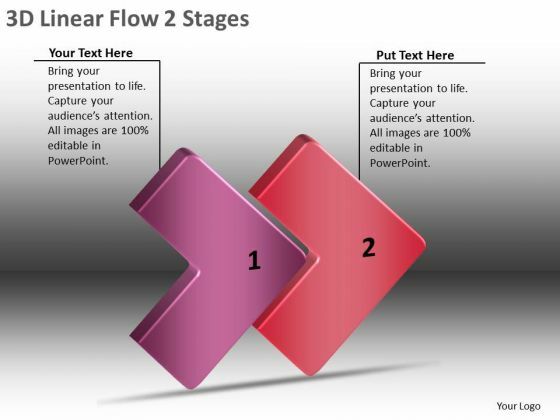 We present our 3d sequential demonstration 5 stages flow chart in business PowerPoint Slides. Use our Arrows PowerPoint Templates because, It is a step by step process with levels rising at every stage. Use our Marketing PowerPoint Templates because, to go for Gold and not just silver. Use our Success PowerPoint Templates because, Show how one can contribute to the overall feeling of wellbeing. Use our Process and Flows PowerPoint Templates because, discuss each one and slowly but surely move up the pyramid narrowing down to the best and most success oriented project. Use our Business PowerPoint Templates because, Marketing Strategy Business Template: - Maximizing sales of your product is the intended destination. Use these PowerPoint slides for presentations relating to Algorithm, Arrow, Arrows Block, Business, Chart, Connection, Design, Development, Diagram, Direction, Element, Flow, Flowchart, Graph, Kind, Linear, Management, Organization, Process, Program, Section, Segment, Set, Sign, Solution, Strategy, Symbol. 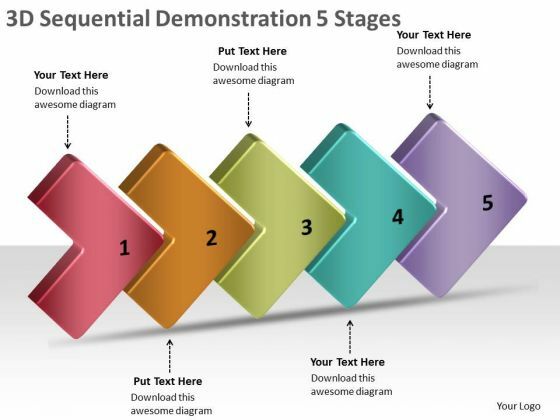 The prominent colors used in the PowerPoint template are Red, Orange, and Green Attain promotions with our 3d Sequential Demonstration 5 Stages Flow Chart In Business PowerPoint Slides. You will come out on top. Some in your community may have fallen on bad times. Comfort them with our 3d Sequential Demonstration 5 Stages Flow Chart In Business PowerPoint Slides. We present our 2 steps for strategic planning procedure business flow chart PowerPoint Slides.Download our Arrows PowerPoint Templates because you require care and diligence to function well. Download our Symbol PowerPoint Templates because you can Unravel the desired and essential elements of your overall strategy. Download our Marketing PowerPoint Templates because you can Ring them out loud with your brilliant ideas. Download and present our Leadership PowerPoint Templates because with the help of our Slides you can Illustrate the means to prevent or control them using our imaginative templates. Use our Process and Flows PowerPoint Templates because you have the entire picture in mind.Use these PowerPoint slides for presentations relating to Arrow, Arrows Block, Business, Chart, Design, Development, Diagram, Direction, Element, Flow, Flowchart, Graph, Linear, Management, Organization, Process, Program, Section, Sign, Solution, Symbol. The prominent colors used in the PowerPoint template are Blue, Black, Gray. Customers tell us our 2 steps for strategic planning procedure business flow chart PowerPoint Slides are Lush. The feedback we get is that our Design PowerPoint templates and PPT Slides are topically designed to provide an attractive backdrop to any subject. Professionals tell us our 2 steps for strategic planning procedure business flow chart PowerPoint Slides will generate and maintain the level of interest you desire. They will create the impression you want to imprint on your audience. People tell us our Business PowerPoint templates and PPT Slides have awesome images to get your point across. Customers tell us our 2 steps for strategic planning procedure business flow chart PowerPoint Slides look good visually. Professionals tell us our Development PowerPoint templates and PPT Slides are Lush. Do a commendable job with our 2 Steps For Strategic Planning Procedure Business Flow Chart PowerPoint Slides. Your audience will keep clapping for you. 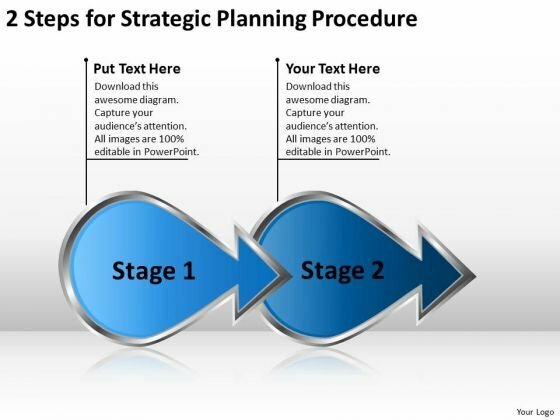 There is nothing far fetched about our 2 Steps For Strategic Planning Procedure Business Flow Chart PowerPoint Slides. Every aspect is correct and achievable. We present our 3d chronicle puzzle illustration 4 stages make flowchart PowerPoint templates.Use our Arrows PowerPoint Templates because this layout helps you to impress upon the audience how your strategy will carry all to the top of the corporate heap. Present our Puzzles or Jigsaws PowerPoint Templates because to achieve sureshot success you need to come together at the right time, place and manner. Download our Signs PowerPoint Templates because it is the time to bond with family, friends, colleagues and any other group of your choice. Download and present our Leadership PowerPoint Templates because this slide is an excellent backdrop for you to enlighten your audience on the process you have gone through and the vision you have for the future. Use our Process and Flows PowerPoint Templates because this slide shows each path to the smallest detail.Use these PowerPoint slides for presentations relating to 3d Puzzle process, Arrow, Arrows Block, Business, Chart, Design, Development, Diagram, Direction, Element, Flow, Flowchart, Graph, Linear, Management, Organization, Process, Program, Section, Sign, Solution, Symbol. The prominent colors used in the PowerPoint template are Blue navy, Green, Black. 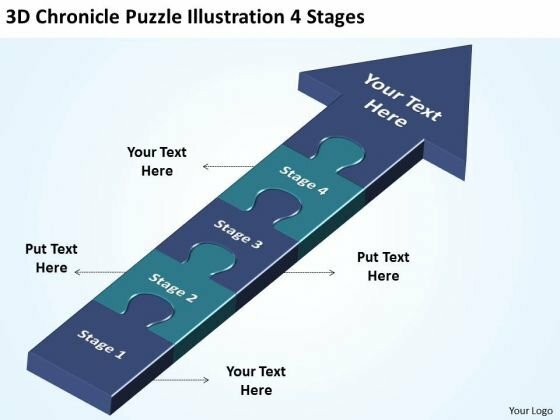 Customers tell us our 3d chronicle puzzle illustration 4 stages make flowchart PowerPoint templates have awesome images to get your point across. The feedback we get is that our process PowerPoint templates and PPT Slides are Flirty. Professionals tell us our 3d chronicle puzzle illustration 4 stages make flowchart PowerPoint templates are Spiffy. People tell us our process PowerPoint templates and PPT Slides will get their audience's attention. Customers tell us our 3d chronicle puzzle illustration 4 stages make flowchart PowerPoint templates are Beautiful. Professionals tell us our Arrow PowerPoint templates and PPT Slides are effectively colour coded to prioritise your plans They automatically highlight the sequence of events you desire. Enhance growth with our 3d Chronicle Puzzle Illustration 4 Stages Make Flowchart PowerPoint Templates. Download without worries with our money back guaranteee. Our 3d Chronicle Puzzle Illustration 4 Stages Make Flowchart PowerPoint Templates team are great exponents of visual art. They have created some beauties for you. 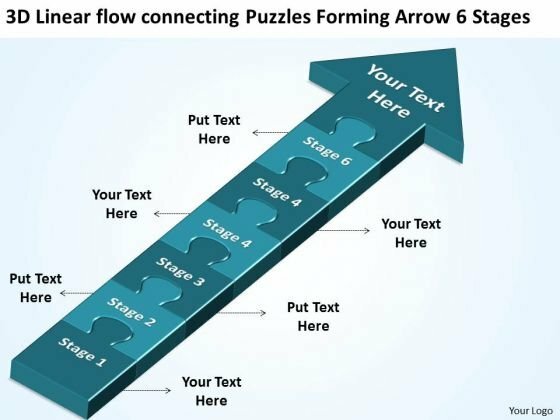 We present our 3d linear flow connecting puzzles forming arrow 6 stages business tech support PowerPoint Slides.Download and present our Arrows PowerPoint Templates because you have developed a vision of where you want to be a few years from now. Use our Symbol PowerPoint Templates because your business and plans for its growth consist of processes that are highly co-related. Download and present our Marketing PowerPoint Templates because customer satisfaction is a mantra of the marketplace. Building a loyal client base is an essential element of your business. Use our Leadership PowerPoint Templates because all elements of the venture are equally critical. Present our Process and Flows PowerPoint Templates because you can Enlighten them with your brilliant understanding of mental health.Use these PowerPoint slides for presentations relating to Arrow, Arrows Block, Business, Chart, Design, Development, Diagram, Direction, Element, Flow, Flowchart, Graph, Linear, Management, Organization, Process, Program, Section, Sign, Solution, Symbol. The prominent colors used in the PowerPoint template are Blue navy, Blue, Black. Customers tell us our 3d linear flow connecting puzzles forming arrow 6 stages business tech support PowerPoint Slides are Handsome. The feedback we get is that our Chart PowerPoint templates and PPT Slides are Wonderful. Professionals tell us our 3d linear flow connecting puzzles forming arrow 6 stages business tech support PowerPoint Slides are Functional. People tell us our Diagram PowerPoint templates and PPT Slides are Chic. Customers tell us our 3d linear flow connecting puzzles forming arrow 6 stages business tech support PowerPoint Slides are incredible easy to use. Professionals tell us our Business PowerPoint templates and PPT Slides will generate and maintain the level of interest you desire. They will create the impression you want to imprint on your audience. Analyse the event in all its colours. Expose the facts to your audience on our 3d Linear Flow Connecting Puzzles Forming Arrow 6 Stages Business Tech Support PowerPoint Slides. Fancy yourself as a success. Our 3d Linear Flow Connecting Puzzles Forming Arrow 6 Stages Business Tech Support PowerPoint Slides will actually make it so. 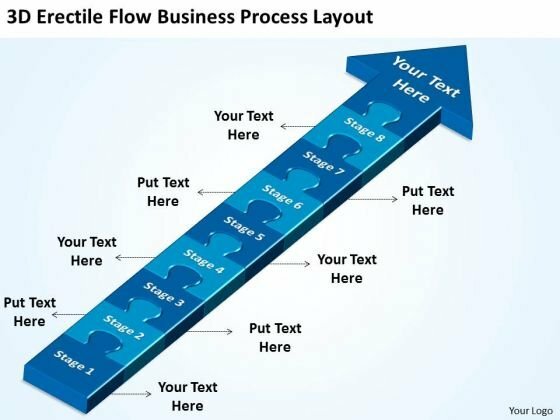 We present our erectile flow business powerpoint theme process layout free schematic Slides.Download our Arrows PowerPoint Templates because there are various viable propositions available to further your commercial interests. Use our Symbol PowerPoint Templates because it helps you to display your ideas and thoughts. Present our Marketing PowerPoint Templates because it outlines the process with this innovative graphic to authenticate your plan of achieving the goal of added value/profit. Download and present our Leadership PowerPoint Templates because with the help of our Slides you can Illustrate how each element flows seamlessly onto the next stage. Download and present our Process and Flows PowerPoint Templates because this slide depicts the occasion for gifting and giving.Use these PowerPoint slides for presentations relating to Arrow, Arrows Block, Business, Chart, Design, Development, Diagram, Direction, Element, Flow, Flowchart, Graph, Linear, Management, Organization, Process, Program, Section, Sign, Solution, Symbol. The prominent colors used in the PowerPoint template are Blue, Black, Blue navy. Customers tell us our erectile flow business powerpoint theme process layout free schematic Slides will help them to explain complicated concepts. The feedback we get is that our Business PowerPoint templates and PPT Slides are Magnificent. Professionals tell us our erectile flow business powerpoint theme process layout free schematic Slides are Glamorous. People tell us our Business PowerPoint templates and PPT Slides have awesome images to get your point across. Customers tell us our erectile flow business powerpoint theme process layout free schematic Slides are Striking. Professionals tell us our Chart PowerPoint templates and PPT Slides are Upbeat. Determine improvements with our Erectile Flow Business PowerPoint Theme Process Layout Free Schematic Slides. Download without worries with our money back guaranteee. Establish benchmarks with our Erectile Flow Business PowerPoint Theme Process Layout Free Schematic Slides. Your thoughts will be an example to live up to. We present our steps to describe a process 4 stages flow chart creator online PowerPoint templates.Use our Arrows PowerPoint Templates because these slides are the triggers of our growth. Use our Symbol PowerPoint Templates because you can Enlighten them with your brilliant understanding of mental health. Use our Marketing PowerPoint Templates because networking is an imperative in todays world. You need to access the views of others. Similarly you need to give access to them of your abilities. Download and present our Leadership PowerPoint Templates because you know that the core of any organisation is the people who work for it. Download and present our Process and Flows PowerPoint Templates because Our Template designs are State of the Art.Use these PowerPoint slides for presentations relating to Arrow, Arrows Block, Business, Chart, Design, Development, Diagram, Direction, Element, Flow, Flowchart, Graph, Linear, Management, Organization, Process, Program, Section, Sign, Solution, Symbol. The prominent colors used in the PowerPoint template are Yellow, Red, Gray. Customers tell us our steps to describe a process 4 stages flow chart creator online PowerPoint templates are Ritzy. The feedback we get is that our Development PowerPoint templates and PPT Slides are effectively colour coded to prioritise your plans They automatically highlight the sequence of events you desire. Professionals tell us our steps to describe a process 4 stages flow chart creator online PowerPoint templates are Versatile. People tell us our Development PowerPoint templates and PPT Slides are designed by professionals Customers tell us our steps to describe a process 4 stages flow chart creator online PowerPoint templates are Clever. Professionals tell us our Design PowerPoint templates and PPT Slides are Upbeat. Exceed expectations with our Steps To Describe A Process 4 Stages Flow Chart Creator Online PowerPoint Templates. You will come out on top. 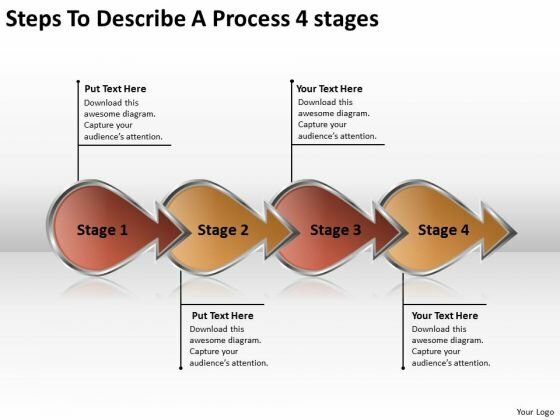 Our Steps To Describe A Process 4 Stages Flow Chart Creator Online PowerPoint Templates are good for any contest. They enjoy every challenge put to them.